Measurements: 3 x 5.1 inches, or 75 x 130 mm. Back of card: Parchment, edged with a black border (similar to the black border on the front). In the center, printed in red, a classic round Chinese symbol, sometimes seen on old coins: A circle divided in quarters, with "hooks" linking top & bottom quarters. (You'll recognize it when you see it, I just don't know the name.) May be inverted. Booklet included: Yes, 35 pages, 2.8 x 5 inches, or 70 x 127 mm. Publisher: US Games. The booklet is printed in the US, the cards are not identified as to country. A guess would be Carta Mundi in Belgium. In Chinese symbology, these four animals make up the four cardinal directions, as found on a compass. In Feng Shui (the term literally means "wind - water") are two schools. One is based on Compass (direction), the other, Form. It would appear this deck is based on the Compass school. I do have a fault with this beautiful deck. 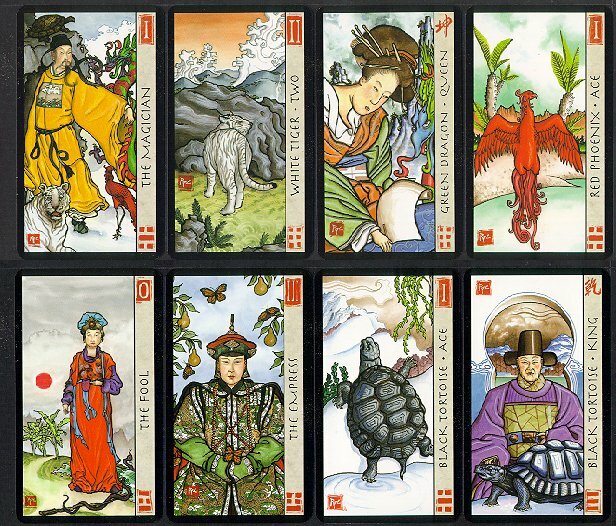 It uses Feng Shui symbols in place of regular tarot-based images. This is fine if you know Feng Shui, which I confess I don't. The booklet with the cards gives no hints, nor at the moment (fall, 2001) is there a book for the deck. For those, like the Connollys, who have studied the subject, this deck should be richly rewarding.